And I'm Shirley Griffith. This year is the two hundredth anniversary of the birth of writer Edgar Allan Poe. The United States Postal Service is honoring him with a stamp. And several museums in cities where he lived are remembering him with plays, readings and other events. This week on our program we explore his life and the continuing influence of his work. And I'm Shirley Griffith. Doug Johnson was our reader. To hear the short story "The Cask of Amontillado" by Edgar Allan Poe, listen at this time Saturday for the program AMERICAN STORIES. And join us again next week for THIS IS AMERICA in VOA Special English. 1. "The Tell Tale Heart" is about an insane ___________ . 2. Edgar Allan Poe was raised by ___________ . 3. Edgar Allan Poe didn't have a problem with ____________ . 4. Edgar Allan Poe died in a hospital in __________ . 5. Poe used the fictional detective ____________ in several stories. 6. 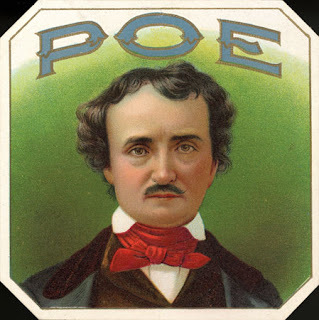 Poe's poem, in which the narrator speaks with a bird is called "___________." 7. Edgar Allan Poe's influence can be seen in the works of ________________ . 8. Poe wrote poems and stories about _____________ . 9. Another name for this selection could be _____________ . c. "A Great American Writer"
10. This selection is mainly about _____________ .